Ethan Williams hits a single against West Valley at home Wednesday, April 3. 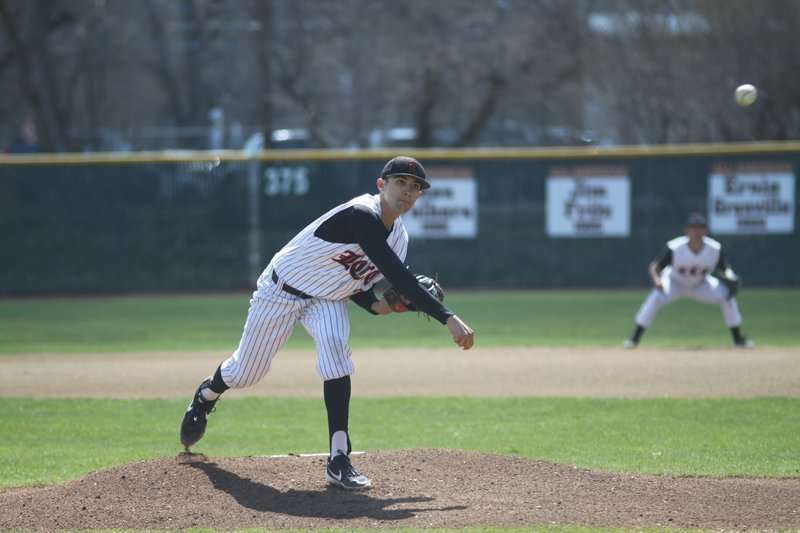 The Lassen High School Grizzly baseball team headed to Gardnerville, Nevada Saturday, March 30 to face Douglas High. 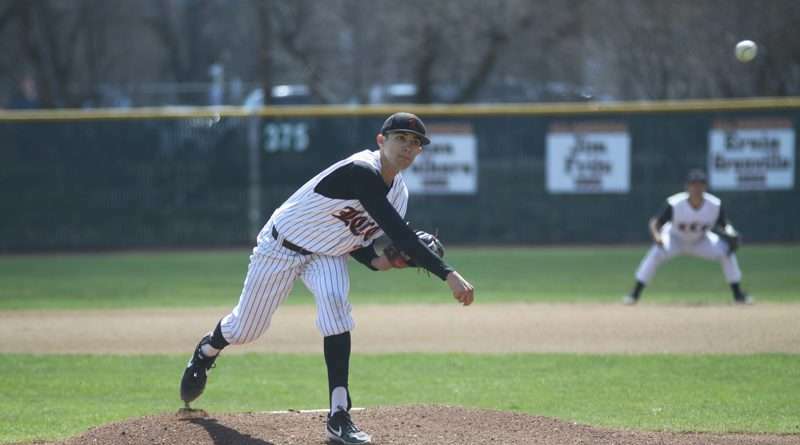 The Grizzlies unfortunately fell to Douglas 9-5, but they made up for the loss when they faced West Valley at home Wednesday, April 3 with a 16-10 win over the Eagles. The Grizzlies looked all right in the start against Douglas with the score tied 3-3 going into the top of the sixth inning with the Grizzlies putting up two more runs before the bottom of the inning. But Douglas would bring it back in the bottom of the inning, where the Grizzlies gave up six runs, two hits, three walks and hit two batters. Starting pitcher for the Grizzlies was Ethan Williams, who pitched four innings giving up six hits, two walks, one strike out and three runs. Pitching in relief was Dylan Enriquez, getting the loss, pitching one inning and an out, he allowed no hits, two walks, hit one batter, one strike out and four runs. Lowgan Fisher then pitched relief to two batters, allowing one hit, one walk, and two runs. Brock Wolf was the last pitcher to pitch in relief allowing one hit, one batter hit, and no runs. Wolf, Williams, Finn Osborn and Cade Lile all garnered one hit, with Lile tallying a double. Miles Ormachea led in runs scored with three to his record, along with three stolen bases. The Grizzlies then took on the West Valley Eagles here at home. The Grizzlies set the tone for the game early with five runs in the bottom of the first. Ormachea got the ball rolling, with a single over second base, then stealing second, and then after a hit by Enriquez Ormachea made it to third. Then, Enriquez on first distracted the West Valley pitcher leading off first for the pitcher to pick him off but gave Ormachea the chance to take home. Wolf got the pitching started for the Grizzlies, pitching for two innings and two outs. Wolf struggled a bit in the top of the first with a couple hits leading to an early run. Wolf finished with four hits against him, four runs, two strike outs and two walks. Fisher came out for relief pitching two outs of an inning, where he allowed two hits, three runs one strike out and three walks. David Painter came in relief next, picking up the win. He pitched two innings allowing one hit, one run, two strike outs, and three walks. Last pitcher was Evan Westfall pitching an inning allowing one hit, two runs one strike out and one walk. Ormachea led in hitting with four hits that included one double and triple. Enriquez, Cole Dyer, Finn Osborn and Painter all finished with two hits. Ormachea led in runs scored as well with five total runs to his name, with Fisher and Williams finishing with three each. In RBIs Enriquez, Williams, Osborn, and Painter all finished with two RBIs. The Grizzlies hit the road Thursday, April 4 to West Valley home field for a rematch, the results were unavailable at press time, but look for the results in the Tuesday, April 16 issue of the Lassen County Times.